I have found how to open the software seems you have to open as administrator and I can alter all my settings and even take a picture however this is where I have the problem bottom green bit is moving from left to right to show saving image but just keeps moving and although I see a icon where it should save the file the file size is zero and it does not seem to save anything. It has worked in the past with same laptop and same camera Pentax K10D but so long ago can't remember what I did that time. I was hoping to set up to take photos of birds in my tree so testing it all out before making hide for camera and trying it out for real. Being able to alter focus in house has to be a plus. Maybe Nikon can do the same but have not got software for Nikon maybe that is also a free down load but not found it. Any ideas? I use the canon EOS software, it works fine Eric. I got a 10 mtr usb lead from ebay so I can be inside my conservatory to take bird shots. You will find it very good if you get your program to work. You must show some of the pictures when you do so. Eureka it works. It would seem cache size was the problem I went from RAW to JPEG and reduced to minimum size for test and it worked. Screen taken with my K10D with the software shown so as test set to 4 shots with 5 seconds between each shot. So next is to find what size file is the maximum and how long a battery will last when connected to PC as it does not go into standby. Also as David says need a long USB lead so now thinking about time lapse photography. Sure it will not last a day but three batteries for Pentax so depends on how well I can change a battery and return camera to tripod etc. Next is ideas of subject to try it with. The playing with the software has taught me a lot about my camera. 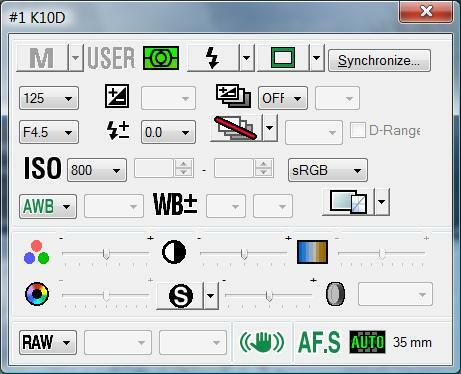 To transfer max control to software one needs to select USER on the mode dial once done then with software I can select the modes Green, P, Sv, Tv, Av, TAv, M B and X once for example Green is selected I can set ISO range so can select max 100 to 1600 once set unplugging camera the settings remain so flick of knob I can have two green modes one 100 to 400 ISO auto range other 100 to 1600 ISO auto range. Using select on focus I can set where it focuses to this has always been available on camera but until I used software had not realized how it worked. There are some down sides also. I never use Jpeg as standard and so after plugging in I have to reset to RAW before using so easy to forget. Had the camera at least 5 years and still learning how to use it. Far simpler than the Nikon D7000 so I suppose it will take 10 years to learn how to use that camera! As to is the software any better than using a web cam well the special features like setting up for time lapse clearly yes but not being able to use it with RAW and limited battery life on camera may be not that useful really but still good fun and if nothing else shown me how to set focus area. I have used SM Tether (from www.smtether.com) which is a free program for computer control of Nikons. I have tried it with my D3200 and it allowed settings control from the PC and is fully functioning but looks much simpler and basic than your Pentax software. The program supports time elapse and exposure compensation bracketing, neither of these features are available otherwise on the D3200. I have yet to try it on my new to me D7000 but I think the program is particularly useful for indoor macro work. Note the work around about bracketing when using recent Windows operating software, highlighted on SM Tether website. 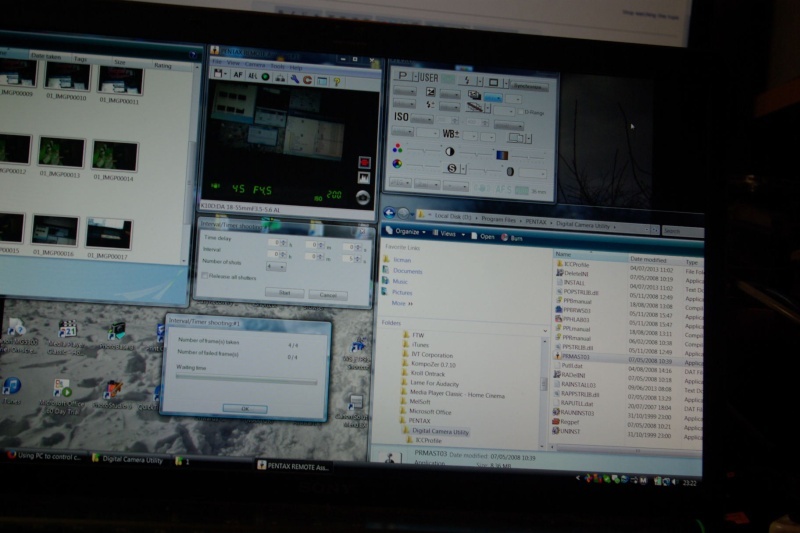 I did try 2 other freeware programs, the names of which I cannot remember, these were also free but didn't work properly or only partially, so these were deleted. Thank you down loaded and quick test the time lapse function worked A1 with D7000 seems there some things to learn with the "Take" command it saves to PC direct (as long as path set) but in spite of being set as RAW saved as Jpeg on PC but also saved as RAW on camera's own card. The "Start" with time lapse however saved as RAW onto the camera's card. It lets you select if flash is used or not (Search/Select Device/Properties) but very little camera control offered but in real terms that's not a problem it allows time lapse and to trigger shutter remote and unlike the Pentax allows using RAW. The exposure compensation the writing extends over the box used to set so can't see what you are doing. The File command which asks to you wish to download seems to have a mind of it's own down loading a few random images. The option to upload direct to web site has not been tested I would not use anyway 19 MB picture on web site is not really what I would want. 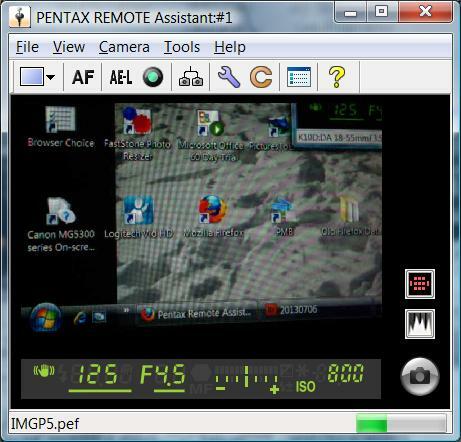 Calls itself SM Tether on program but Nikontrol 3K on task bar. At 3.2 MB quite a small program and to me does enough. On D7000 the file info just says Model NIKON D7000 the window shown on web site for D3000 shows a lot more info. Think camera can be set to bracket without using PC program so Time Lapse and remote shutter control is really enough. Thank you Harvey Mutch. With connection to PC camera does not auto shut down so total time on battery is around two hours. With times of less than a minute failure rate was really too high so one frame a minute seems to be best I can do. When played back at 25 fps plus 99 picture max means the play back is around 4 seconds OK can set Adobe Premier Elements 4 to double time for each image so can stretch it out a little and replacing batteries and restarting can also extend but for any serious work I think a timed cable release is way to go not the PC. Cost nothing and good experiment but not really something I am likely to use in a hurry. It does let one do like in the photo booth take a series of self portraits without touching camera or PC once mouse is clicked and with Pentax allows on to set the USER function but as far as time lapse goes it was a failure. Not really done much with the bulb option this does allow very long timed exposures but again failure rate is a problem. After setting up camera and PC to return and find it has failed does not have to happen too many times for one to give up. Simple remote cable release with lock seems to do a better job.